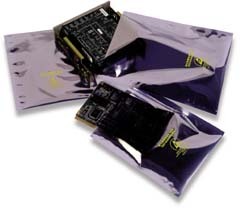 Metal Out ESD Shielding bags protect static sensitive components from all types of ESD damage with full Faraday cage shielding as well as from internal tribocharging with a static dissipative polyethylene inner layer. The metalized layer is 48-gauge polyester to provide puncture resistance. An antistatic, abrasion resistant coating protects the outer metal layer. All bags are labeled with product number, manufacturer’s name and lot number. Light transmission of 40% permits easy identification of contents. An excellent reusable packaging material for static sensitive components and assemblies.